The Manor-house Mojmírovce**** - Mojmír Foundation. The Manor-house Mojmírovce**** is located in the village of Mojmírovce, inside an 18th century Baroque-Neoclassical mansion. The Manor-house Mojmírovce**** is a cultural monument built in 1721. Today it is a four-star congress hotel surrounded by a magnificent old park, combining history and modern times. 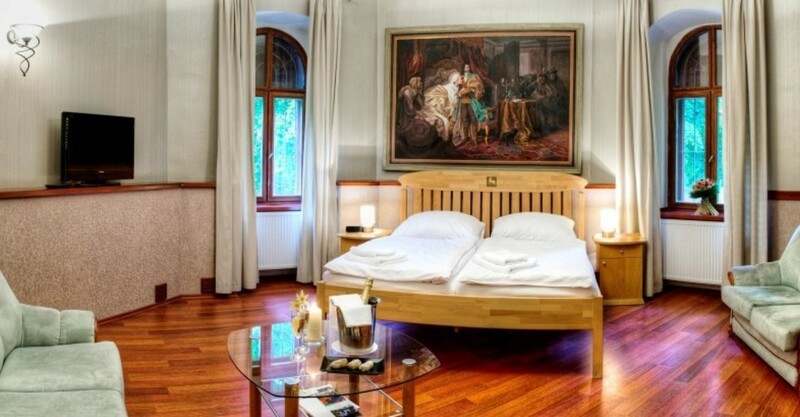 The manor house has hundreds of paintings reminiscent of its past along with salons dedicated to Count Anton Grassalkowich of Mojmírovce and the manor’s original owners, the Hunyady Family. Inside the mansion, the Hall of Tolerance depicts the world’s religions along with important historical figures. The interior also has a unique, truly iconic lounge with 130 icons, a hallway with scenes from Slovak folktales, a 25-meter covered pool in the style of a winter garden, the new wellness, a corridor with copies of the world’s most famous works of art and a wine room and cellar awarded a world prize for its brick construction. In addition, there is a 25 meter covered shooting range and a convention hall that seats 150 at a famous breeding farm located in Mojmírovce. A place where every step is full of history will enchant you with its stories and will offer moments of relaxation in a beautiful park, and also in the Relaxation centre. Enjoy pleasanst relaxation in the romantic in the romantic atmosphere of the Manor-house Mojmírovce and a rest in the Relaxation centre and renew your energy in a unique environment that inspires. The large spacious manor belonging to the Hunyady counts had at one time included an orangery with a small botanical garden. It was appropriately placed in the southwest to gather the warmth and sunlight needed by thermophilic plants. Here subtropical trees grew with ripening figs, oranges, lemons and tangerines. The Countess loved flowers and was making beautiful arrangements at various occasions. She had been a widow since 1927 and tried where she could to help. During the war, she freed the ground floor of the manor house up for German children. However, no one can remember the motivation behind it. It could have been coerced. A camp for German boys was opened in 1943. Groups of boys 10-14 years of age staying here were rotated. Terézia Košťálová, recounting the story, had been employed here at the time with her sister Julia. In addition, there were other German staff from Urmín (Mojmírovce) and the surrounding area working at the manor. Terézia and her sister were maids in the kitchen. Lights out for the children was at 9:00 pm, for they would be waking up the next morning at 6:00 am. After dinner, Terézia and her sister cleaned the dining room and washed the dishes. They were completely tired by the time they fell into bed. In the middle of the night a loud, desperate, pitiful crying and wailing was heard, along with a call for help. It seemed the walls of the manor were reflecting the sounds and intensifying them. The moans carried throughout the halls and rooms. The German boys that had been sleeping were petrified with fear and as pale as the walls, running barefoot in their underwear toward the main vestibule. They shouted, cried and some hysterically screamed. Suddenly the entire staff flocked together and shouted. There was a lady in white. We were scared. The white lady was there pointing in a direction. It appeared that she was looking for someone. She stood there hovering. Help us. Suddenly the Countess came running pale in her bathrobe. She had come without a word. Then she walked around the children’s bedroom and left without speaking a word. She never said anything about the event. It was rumored among the servants that the unlucky white lady was looking for her child. Apparently, a poor single girl had become the mother of a small aristocrat. The father was only interested in his son and never in the mother. She died young and unfortunate under unusually tragic circumstances. All the witnesses to tragedy are long dead. Was the ghost of the young mother looking for her child? Would she ever find him and her soul be in peace? A few days later that shift of boys left and returned to Germany. Terézia and her sister were washing, ironing and cleaning the entire day. Everything had to be ready for the next group of children. The following night the ghostly figure appeared again. Finally, Terézia remembered the words of Deacon Bílek. He had said there was no need to worry about it haunting the manor, that it was either an unhappy soul asking for help and forgiveness or who had forgotten to tell someone something. In the light of burning candles and kneeling stealthily with rosaries in her hands, she prayed piously for the stray soul to have peace. The spirit promised not to haunt her. The manor house has ever since been quiet, with no weeping and wailing. The crying woman had found peace. Mojmírovce Manor Hotel has many years of experience organizing that special wedding. Ceremonies with both Slovak and international couples have been successfully conducted and catered. High-quality rooms and services allow us to have your romantic wedding, that special day in your life, prepared for you according to your thoughts and ideas. The ceremony can be held either in the rooms of the manor house or in the open air of the park reserve, such as at the fountain. If a large number of wedding guests will be spending the night, we offer discounts on lodging. Free parking in an enclosed, CCTV-monitored area on the manor grounds. Naturally, our services include staff ready and willing to make the wishes and desires of the newlyweds and their wedding guests come true. We would be honored to contribute to a long-lasting memory of your wedding day. Looking for representative rooms suitable for conferences, workshops, trainings, business presentations, teambuilding events, sports and cultural events, garden parties, weddings, family gatherings, balls? If you want to be sure that your event will be professionally prepared, and at the same time you may enjoy it with the feeling that everything is taken care of, the Manor House Mojmírovce is the is the right place. Thanks to our extensive experience in organizing of Slovak and international events, variable offers of exceptional facilities and fantastic cuisine, with us you can acquire a reliable partner for organizing your events. Contact us and we will be pleased to prepare an offer tailored to your wishes and requirements. Mojmírovce lies about 15 kilometers from Nitra, a regional center. The center of the village features an extensive reserve, in the center of which is situated an 18th century Baroque-Neoclassical mansion associated with the noble Hunyady Family. The manor’s history began after the end of the Ottoman Turkish invasions, when refugees forming the original prewar population began returning to the land they had originally settled, with many newly-arrived migrants leaving with them. At the time, the village first appeared and was called URMÍN, the name given to it by the HUNYADY family. Noblemen András and László Hunyady arrived in Urmín in 1675. They gradually came to own the most property, becoming the wealthiest family in the village. In 1721, Imre Hunyady had the Baroque mansion built. Later after it was damaged by fire, the manor house was reconstructed in neoclassical style. In addition to the mansion, the Hunyady family also ran the spacious park with a number of exotic trees, shrubbery and plants, and which in subsequent decades became one of the most beautiful parks in Upper Hungary. A rarity was the greenhouse, a botanical garden that unfortunately has not been preserved to this day. The pride of the Hunyadys was the breeding farm, where they raised Arabian, Italian and Spanish Thoroughbred horses. In 1814, József Hunyady organized in Urmín Austria-Hungary’s first ever public Thoroughbred races under modern rules. 13 horses raced on a 2600-meter long track. The most famous horse of the Urmín line was Tajár (1811-1830). Originally from Egypt, it became the founding stud horse for breeding Hungarian Warmbloods. Tajár won the first year the horse races were held. His skeleton is currently kept at a veterinary museum in Vienna. After the Second World War, the last descendants of the Hunyady noble family left their residence in Mojmírovce. The mansion was then used for several different purposes: immediately after the liberation of Czechoslovakia, barracks were temporary established and when the soldiers left there were apartments established for teachers, offices for doctors and a pub. In 1953, the building became a primary school. When the school closed at the end of the 1960s, the mansion was left to deteriorate. The manor became in 1974 the property of a Slovak consumer cooperative and after extensive and gradual reconstruction and renovation it is now the headquarters of the hotel Kaštieľ Mojmírovce***, Vzdelávací inštitút COOP, a.s. (COOP Education Institute) and the Mojmír Foundation. On the site of the former breeding farm, which had almost fallen into ruins, a modern hotel and convention center was built. The renovated rooms of the mansion today house a restaurant, wine cellar and wine bar along with several classrooms, suites and regular hotel rooms, a relaxation center and a shooting range for short weapons in the basement. But the manor today does not lack for pomposity. It is surrounded by a wonderful English garden with a reconstructed fountain and four-meter oak statues of saints and patron carved by Marek Žitňan. The mansion’s enormous entry hall, with an elegant theatrical staircase adorned in the original luster of the reign of Maria Theresa and restored to a modern image, features life-sized portraits of the last century’s most famous Slovaks. The central corridor in the mansion is called the Hall of Tolerance. It is adorned with symbols of the world's largest religions and several dozen portraits of philosophers, writers and scientists. The two original rooms were honored with the name “Africa", where Count Huňady spent time as an avid hunter and shooter and in which he exhibited trophies from his hunting trips in Africa. Here the Africa Salon has been established, decorated with pictures and masks from that continent. The restaurant dining rooms are likewise stylized in different ways. The largest room is set in the hunting style characteristic of the entire manor house before 1945. Modern pictures with a hunting theme have been added to complement the trophies. Other rooms in the restaurant area are the Picture Gallery and the Rose Salon, a lounge that leaves a romantic impression. The Rose Salon includes paintings created by Slovak artist Irena Polanec. A vaulted brick wine room is today located in the mansion’s basement rooms. The extensive reconstruction was conducted by architect Viktor Šabík. At an annual international competition organized by Weinerberger, the world’s largest brick manufacturer, the wine cellar was chosen from among 260 submitted designs from around the globe, and in Vienna architect Viktor Šabík and his team were awarded the 2010 Brick Award for their work. The rooms in the three-hundred year old wine cellar are today a place where history meets art. The atmosphere of both the wine cellar and wine room comes from the 120 wine and viticulture themed pictures that have been produced by 24 academic artists. Other underground space is used as it was originally designed. The covered shooting range for short weapons operates year round. The pride of the manor is the corridor that joins the main building to the relaxation center and swimming pool, which is decorated with exquisite colorful scenes from Dobšinský’s Slovak fairy tales in a huge 18 x 2.3 meter painting by academic artist Táňa Žitňanová. Besides the folktales, Slovakia’s most famous castles and palaces are also captured. Part of the hallway is dedicated to the spirits and ghost stories associated with the mansion and its surroundings. In the Manor-house Mojmírovce you can enjoy a pleasant relax not only after a busy day. Recreation offer our customers a space for active recreation, but also caress your body and soul. Our clients will find also other interesting features such as a restaurand, bar and gallery. At the place where the Hunyady family’s winter botanical garden once stood is now a swimming pool. The interior itself of the pool is unique and reminiscent of the winter garden. The ceiling features one of the largest contemporary paintings in Slovakia, “Orchid Flowers", measuring 15 x 10 meters and painted by academic artist Jana Farmanová-Šabíková. 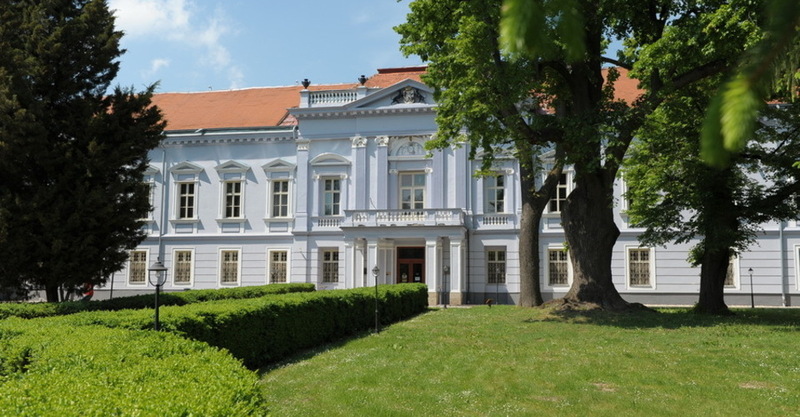 The mansion also includes a lounge to remind all visitors that Mojmírovce was once the birthplace of Count Grassalkowich. The walls of the lounge are adorned with life-sized portraits of Anton Grassalkowich and Queen Maria Theresa painted by academic artist Jarmila Veľká, carved figures of the most famous buildings constructed by the Count, coat-of-arms of the period, suits of armor and a large panorama showing the coronation of Maria Theresa produced by academic artist Táňa Žitňanová.